San Francisco, CA - (November 10, 2015) Out of the shadows and ready to rumble, Scarface Imperial Stout is back with a one-two punch from Speakeasy Ales & Lagers. The man, the myth, the legend, will arrive in stores and on draft in two bruising variations. Get a taste of mob life this fall and winter by enjoying the original Scarface Imperial Stout, and a special bourbon barrel-aged edition. Behind its fierce black exterior, Scarface Imperial Stout is a complex blend of flavors. A rich combination of grains was used, including two-row pale malt, carahell, dark crystal malt, de-bittered black malt, flaked oats, and roasted barley. Columbus hops were added for bittering, while Magnum hops were thrown into the whirlpool for a touch of earthy and floral notes. The beer pours a viscous inky black with a mocha colored head. Enticing aromas of bittersweet espresso and toffee lead to the first sip, which hits you with chocolate, roasted malt, dark bread, and burnt caramel. Scarface Imperial Stout ends with a dry finish, and weighs in at 9.5% alcohol by volume and 50 IBUs. If that’s not enough, the bourbon barrel-aged edition of Scarface Imperial Stout will assault your senses with sweet caramel, oak, and vanilla. A fresh batch of Scarface was blended into a 2014 vintage that was aged in American whiskey barrels for over one year. The resulting beer is wonderfully balanced and delicious. Drink it now or age the wax-topped bottle in your cellar for a few years. 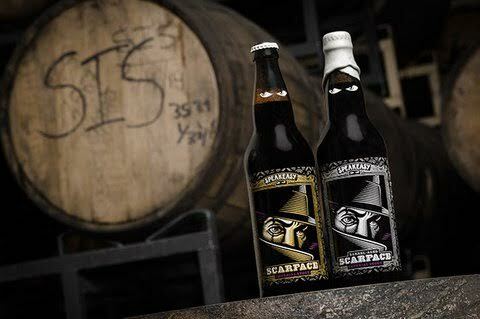 Both editions of Scarface Imperial Stout are being shipped to distributors this week and will arrive in stores by the end of November. Can’t wait that long? Visit the Speakeasy Ales & Lagers Tap Room for the Scarface Imperial Stout Release Party on Friday, November 13. Original and barrel-aged versions will be served on draft, along with several vintages. New and vintage bottles will also be available to go. Quantity restrictions will apply to purchases of older bottles. Don’t miss this unique opportunity. Enjoy a glass or taste through the ages with a flight.